1956-1967; later refurbishments. Square-plan timber boarded sentry box (approximately 2 metres by 0.75 metres by 0.75 metres) with cross-gabled zinc clad roof, central ventilator. On concrete base. Timber boarded construction clad with black painted flush plywood, rectangular panel inscribed "BOX 746" to sides; door weathering fillet above; yellow painted strips to each corner. Bargeboarded gablets with winged interlaced "AA" livery (1990s re-branding) flanked by backlit square name panels "LOCH ALLEN" [sic] to left, "BOX" to right to each face. INTERIOR: chipboard flooring; plastic-lined, cupboard to rear; 3-button telephone (disconnected, 2002) to right. 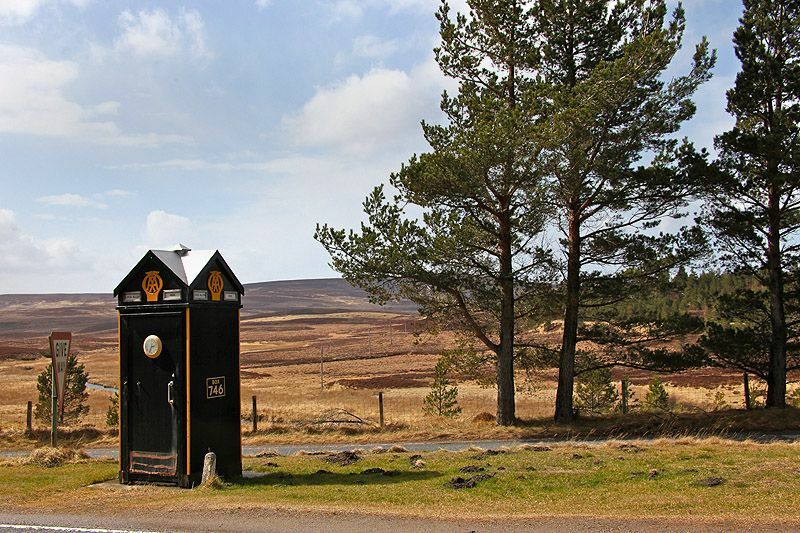 This box lies in a scenic, woodland location at the junction of A940 and A939, with views down Loch Allan. A symbol of national transport heritage, AA sentry boxes played an important role in the development of road communications and safety in Britain from the 1930s until 2002 when AA phones were finally disconnected. AA sentry boxes were first built to protect road patrollers from the weather when they travelled on bicycles and later on motorcycles in the first half of the 20th century. Later boxes had chalkboards on which to leave messages for passing members, and were also used as safety boxes, equipped with sand buckets and fire extinguishers. Eventually, telephones were installed with the development of the national telecommunications network. This box is of the 1956 post-war pattern that was manufactured up until 1967. After 1967 sentry boxes were no longer produced. The designer of this box type is not known; however the boxes were manufactured by Enham Industries, Alamein, Hampshire, a firm that employed disabled ex-servicemen. At the time of its original installation, this box would have had the AA's winged livery logo; however, boxes were re-badged after 1967 with the introduction of the company's new square logo. In the 1990s, a programme was instituted to return new square-logo badged boxes to the original winged livery, as at Dava. AA sentry boxes are now very rare. At one time there were approximately 1,000 in service but now there are only 21 remaining in all of Britain, of which 8 are listed in England and 1 in Wales. This box at Dava is one of 7 remaining AA sentry boxes in Scotland, of which 6 are listed (2003). See separate listings under "AA Sentry Box".